Full title: 'Ducatus Eboracensis Pars Borealis. The North Riding of Yorkeshire'. 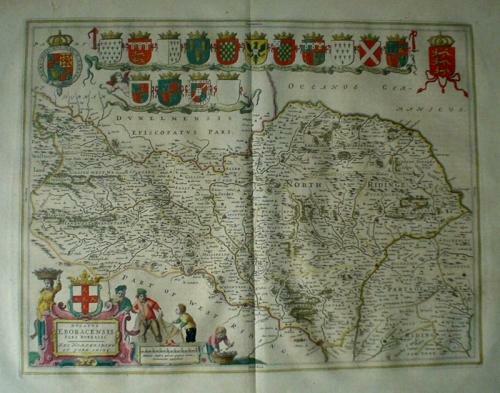 A handsome map of North Yorkshire with a large decorative title cartouche to lower left corner. The map is adorned with fifteen shields to the upper edge, fourteen of which bear family crests plus one left blank. There are two larger coats of arms, including the royal crest, to the upper corners. The map is in excellent condition with a centrefold as issued. There are no discernible faults and the paper is strong with wide margins.